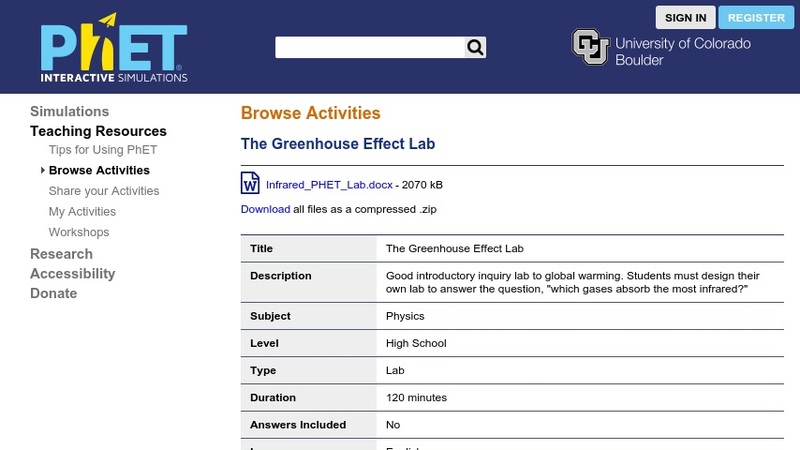 This page features an inquiry-based lab, created by a high school teacher for use with the PhET simulation Greenhouse Effect. The author gives explicit instructions for using the simulation to conduct an experiment. The experimental question: "Which atmospheric gas -- methane, water, carbon dioxide, oxygen, or nitrogen -- is the best absorber of infrared photons?" Students will be using the "Photon Absorption" section of the simulation, in which they shoot infrared and visible photons from a virtual emission gun. They can change and adjust levels of each gas to build their own atmospheric conditions. A comprehensive rubric is included. The related simulation, which is required to complete this activity, is available from PhET at: Greenhouse Effect Simulation. This item is part of a growing collection of simulations by the Physics Education Technology Project (PhET). Simulations were designed using principles from physics education research and refined based on student interviews and classroom observations.